Below is a short summary of the three areas highlighting some key design considerations based on the feedback received. As part of the project, a pedestrian crossing will be added at Merivale Road and Viscount Avenue. The crossing will connect to a new concrete sidewalk through the triangle to the Merivale Road and Carling Ave intersection. The new concrete sidewalk and the crossing will be built to the City’s accessibility standards and will be maintained throughout the winter. The curb along the triangle will be shifted to narrow the one-way section of Merivale Road to 5.0 metres. Reducing this one-way lane width will shorten the crossing distance for pedestrians and will also help to calm traffic along this section of the street. 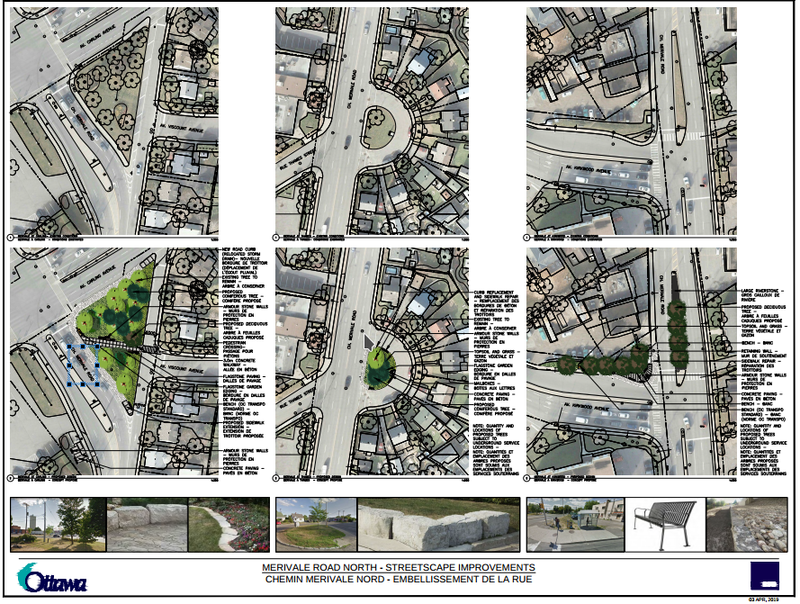 The existing sidewalks along Merivale Road and Carling Avenue will also be extended to meet the edge of the new curb. Armour stone walls will be set back from the edge of the new sidewalk within the traffic triangle. This landscape feature will provide an opportunity for informal seating as opposed to a formal seating area. Armour stone will also be added to the southern tip of the traffic triangle to create a barrier from traffic. The landscaping beds will be replanted with drought resistant plants in consultation with the members of the Community Association. There was a request for water access within the traffic triangle for landscaping; however, after reviewing all of the options within the constraints of the budget, drought tolerant plantings was chosen as the most sustainable, long term solution. The garden beds will also be edged to prevent damage from grass cutting. Coniferous trees were chosen to provide greenery year-round; however, there were concerns that coniferous trees may pose a safety concern as they may provide an area for people to hide. As a result, coniferous trees will be planted away from the new sidewalk in order to balance the desire for more greenery and to help mitigate safety concerns. Even though the existing bus stop in the traffic triangle (northbound on Merivale Road) currently has low ridership, a bench will be added to this stop in anticipation of the increase of residents in the area as part of the redevelopment of the Westgate Shopping Centre. Across the street at the bus stop (southbound on Merivale Road); the existing ridership is very high and so an additional waiting area for riders will be added behind the bus shelter to take advantage of the shade that the existing trees and shrubs provide. Armour stone will be added along the back edge to define the waiting area for riders and provide the opportunity for informal seating with shade. New coniferous trees will be planted in the circle along with the addition of armour stone placed along the edge of the circle to help to prevent cars from driving over the curb and illegal snow dumping. The curb will be replaced and the sidewalk will be repaired. The proposed bench was not included in the final plans, as the majority of the comments did not see the need for seating in this location. A new plaza space will be created along with a row of trees planted adjacent to a small retaining wall abutting the parking area. The trees will help define the space, provide shade and a buffer from the parking area. Benches will be set back from the street to provide some buffering from the traffic and to take advantage of the shade from the new trees. Armour stone will be placed closer to the sidewalk to help define the space and provide an opportunity for informal seating. The sidewalk will also be repaired. The bench at the bus stop along Kirkwood Ave will be replaced and an additional bench on the north side of the bus shelter on Merivale Road will be added. Deciduous trees will be planted in the median and large riverstone will be added to the narrow portion of the median. There were many supportive comments about the use of riverstone as a landscaping feature; however, there were also concerns raised about long term maintenance and some safety concerns. As a result, riverstone will only be used in the median. The median will be excavated and lined underneath to prevent weeds. The timing of the project is subject to funding from the Province. As a result, construction will take place this year and completed before the end of 2019 to meet our funding requirements.